Sometimes the very best business relationships go pear shaped. Often there doesn’t seem to be a tangible reason – things just seem to go stale and the business suffers – as do the personal relationships of the business partners. Some of the very best businesses are built on remarkable partnerships where the business partners are able to leverage off each other and build something special. These “marriages made in heaven” don’t happen by chance. They are built off the back of clear understanding of and commitment to the overall cause. It sounds easy and many business partnerships are entered into with common goals, beliefs and mutual commitment but for some reason or another, they break down over time. It’s understandable. Like it or not, we are all human. We all make mistakes and our goals and priorities are likely to change throughout our life. Changing circumstances lead to changes in priorities and commitments. 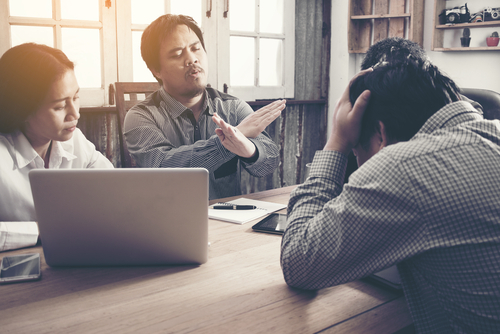 These changes often lead to conflict within the business, mistrust, poor communication and escalating tensions. There’s no point in ignoring the signs. Once the business relationship starts to go a little stale, you need to be able to address the problem openly and honestly. Often, quick decisive action can help clear the air and help all parties to clear up misconceptions and to re-evaluate their involvement in the business. However, there are times when conflicts can’t be satisfactorily resolved and decisions have to be made that will be to all party’s satisfaction. To attempt to carry on a business partnership when trust and communication have broken down is a recipe for disaster. The business partners need to find a way forward. They need to agree on an exit strategy. This could be as simple as one partner buying out the other or agreeing to sell the whole business to a third party. Which partner is most passionate about the business? Steve Makris, CEO of Business Help Now, a business advisory service dedicated to helping business owners solve problems has seen the scenario play out repeatedly. He sees the key to sorting out partnership differences to be good honest communication. “When things go bad, partners need to come to an agreement on the best course of action moving forward. They need to be honest about their needs and what they want. In some cases, reaching an agreement may require mediation of some form,” said Steve. Steve speaks from experience gained through years of helping business owners through the difficult process of exiting business partnerships with dignity. He has seen the highs and lows of people working in business partnerships and can help you work through any partnership issues that you may have.. He is currently offering an introductory 45 minute consultation to help you identify exactly what you can do to improve your existing business or to establish whether that business concept that you’re interested in is right for you.